Heat the water for the pasta. In the meantime, place the garlic in a pan with the cold olive oil over medium heat. Once the oil begins heating, the garlic will begin to brown. Remove them before they take on too much color and set aside. Sauté the onions in the same oil until they’ve browned lightly. Season with salt, pepper and part of the parsley. Remove and set on a dish. Heat the cream in the same pan and cook to reduce a little, but without letting it boil. Season well and combine with the mushrooms and the rest of the parsley. When the water boils, add salt and cook the pasta for as long as indicated on the package. Strain and combine with the mushroom cream and edam cheese. Serve the pasta hot and sprinkle with the slices of fried garlic and parmesan cheese. Add ground pepper if you like. Garnish with parsley. Use fresh oregano instead of parsley. If you would prefer a Mediterranean version, make the sauce with a can of ProgressoTM tomato sauce and add the mushrooms with chopped black olives. Add a strip of bacon to give it a bit more flavor. You can use spaghetti instead of fusilli. 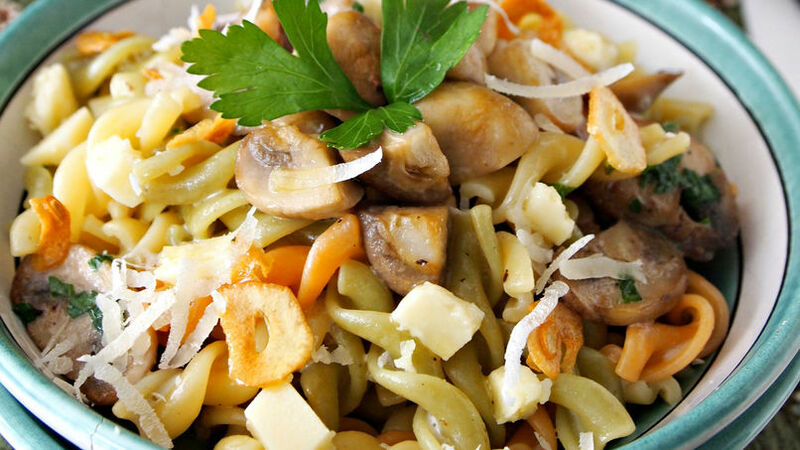 Do you enjoy recipes that combine pasta with mushrooms? I do too. This is why I always look for ways to include it in my weekly menu, whether it’s with a creamy sauce, olive oil or tomato sauce. I also like to make Italian pasta sauces with plenty of vegetables and cheese. I think it’s a great combination and I feel great when I eat it. Fall is my favorite time year with its weather changes and new colors. I love watching the leaves change and it inspires me to create delicious recipes with pasta and mushrooms. Sometimes I enjoy preparing my own spaghetti from scratch, other times it’s just easier to buy boxed pasta, especially when I want to use tricolor pastas in white, green and red, like the one I use for this recipe. The dishes made with this type of pasta are visually attractive and vibrant. They don’t need much garnish, perhaps just a few sprigs of fresh oregano or parsley and a bit of garlic. Always use good parmesan cheese as well as a good cream sauce. If you don’t have whole grain pepper, use powder, but remember that when it’s freshly ground it gives off a delicious aroma. This pasta recipe can be prepared quickly, making it a great option for days when you arrive home late and don’t want to spend too much time cooking. Serve with vegetables and you’ve got a complete meal. Enjoy!